A Savannah cat is a cross between an African Serval and a domesticated house cat. Once you've seen a Serval with it's plus-sized ears, long legs, boundless energy, and sleek fur coat, you'll understand just why Savannah cats were created! 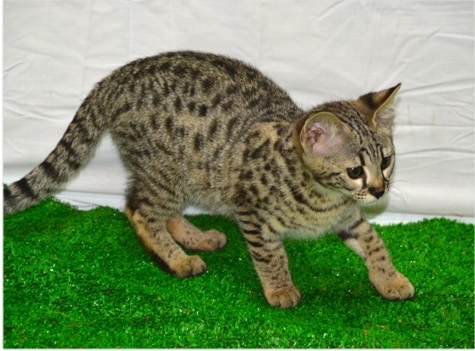 Savannah cats are the largest hybrid-breed cat available in the world. 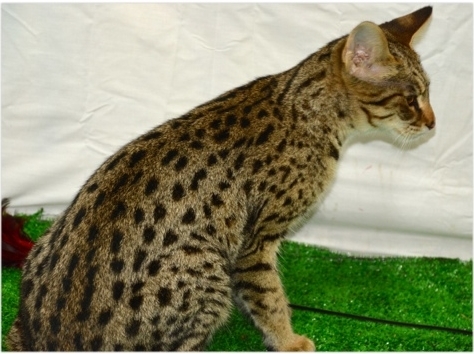 They are smaller in size than Servals, but are much more manageable as a pet. Males tend to range from 15 to 30 pounds, whereas females range from 9 to 17 pounds. Colors of their coats range from black to smoky to spotted. Cats with spotted coats typically have bold black spots against a background of silver, orange, or gold. The Savannah breed is intelligent, confident, playful, curious, tireless, and charismatic. The cats are very much dog-like in that they are readily trainable, love playing fetch, and enjoy walks outside with their trainers. Savannahs have so much energy that they tend to tire out the other family pets! They get along very well with pet dogs and often confide in them as playmates. Savannah owners say that their cat generally waits at the door for them to arrive home, and follows them around from room to room.